Capitol pizza: "good," says Kyle; White House tour by Secret Service: "cool"
Editor's note: CNN.com profiled Kyle Graddy last summer when he attended his first pro-baseball game during a peanut-free night in Birmingham, Alabama. Three million U.S. children suffer allergies to peanuts and other foods, which can cause anaphylaxis and -- if left untreated -- death. Last week, Graddy traveled to Washington to lobby for legislation that would create voluntary national guidelines on how schools deal with students with food allergies. 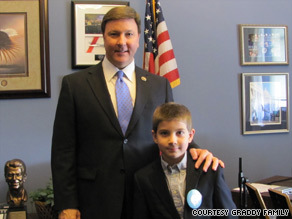 Kyle Graddy, 9, lobbies Rep. Mike Rogers, R-Alabama, about pending food allergy legislation. WASHINGTON (CNN) -- My name is Kyle Graddy. I'm 9 years old and I have a peanut allergy. I traveled to Washington last week to help myself and other kids with food allergies to have a safer experience at school. I represented the state of Alabama in the Kids' Congress on Capitol Hill sponsored by the Food Allergy & Anaphylaxis Network. There were 80 kids and 73 families from 24 different states participating in the Kids' Congress. Kids with food allergies are just like any other kids, they just can't eat some foods because it could make them very sick. We want Congress to make a new law that would help us not to worry as much about our food allergies and stay safe. I think it is important for the kids with food allergies to speak with the senators and congressmen because we can tell them what it is like to live with the food allergies and how hard it can be to feel safe at school when there are no real guidelines for anyone to follow. On the first day of the Kids' Congress we rode a bus to the Capitol and had our picture made on the steps. They took a serious picture -- and a silly picture. Next, we all split up and went to meet with senators and congressmen from our states. I was kind of nervous because I have never talked with a senator or congressman before. The Russell Senate Building was very big and was across the street from the Capitol. The hallways were long and full of lots of offices. My first meeting was with Graham Smith of Sen. Richard Shelby's office. During our 10-minute meeting we sat at a big table in a conference room. I told her about my allergies and how hard it can be for kids at school with food allergies. Later, I saw Sen. John McCain's office and his assistant gave me an autographed picture of the senator. I also saw President Lyndon Johnson's old office. My second meeting was with Rep. Mike Rogers, who is from my home state. We all sat in chairs and talked for about 15 minutes during our meeting. Congressman Rogers had a big desk with Auburn University pictures and an Auburn University football helmet in his office. Rep. Rogers was very nice. He welcomed me to town and asked me about my food allergies. He also asked me about my EpiPen [the auto-injector]. I always wear it, so I showed it to him and told him how to use it. I talked with him about how hard it is sometimes to be at school with food allergies. The meeting went very well, because Congressman Rogers said that he would co-sponsor the food allergies bill. The bill would make voluntary national guidelines for schools to use in order to help keep kids with food allergies safe. The guidelines would make school much easier for teachers, school nurses, principals, parents and kids with food allergies. Moms and dads would not have to start over each new school year teaching the school teachers, principals, and nurses how to keep their children with food allergies safe in a new classroom. At the beginning of the school year, the school would know that a child has an allergy and would also know exactly what to do for the child to be safe. Also, when I change schools from elementary to middle school, the new school would be prepared for my food allergies. With national guidelines, I would also be safer at school if my family had to move to another state, because the guidelines would be the same. It was cool to meet other kids that have food allergies like me. I met one friend who is allergic to peanuts, tree nuts, milk and wheat. He is 11 years old. The next day I also met for about 5 minutes with people in Sen. Jeff Session's office. In between the meetings on Capitol Hill, I went sightseeing and ate lunch. They had very good pizza! Debby McBride of Congressman Rogers' office gave us a tour of the Capitol Building. The tour was so cool. I got to see the House and Senate Chambers and Sen. John McCain was there. At the Capital, I got to see the old Supreme Court. I also went through the Cannon Tunnel. During our trip we also saw a lot of the other great sites around Washington, including the White House. We got to go on a tour and we had to go through tight security. The tour was led by a Secret Service agent. I liked the painting of Abraham Lincoln that was hanging over the fireplace in the dining room. At the end of the tour, we walked out the front door of the White House. That was so cool! The Kids' Congress on Capitol Hill was exciting. I feel pretty good about it. I really liked Washington and can't wait to go back.